Good morning and Happy Friday everyone. With Halloween over Thanksgiving is fast approaching. Time to start planning our menu's and getting our decoration ready. This morning I have to share this adorable cupcake wrapper. How cute this will be sitting on the buffet with some YUMMY pumpkin cupcake in them. Was easy to make. Merged a copy of the Turkey image with the wrapper then glued the Turkey to the front. OMG!! Your turkey cupcake wrapper is so adorable!! This is one cutie of a turkey wrapper, awesome idea to place on that festive table. Oh I just LOVE this adorable turkey cupcake holder!!!! That cupcake sure looks yummy! Who stuck their finger in that icing? Gobble! Gobble!! I absolutely love this turkey!! Absolutely adorable!! What a super ADORABLE turkey!!! Love it!! Have a great day. OMGOSH... Look at how cute that turkey is! 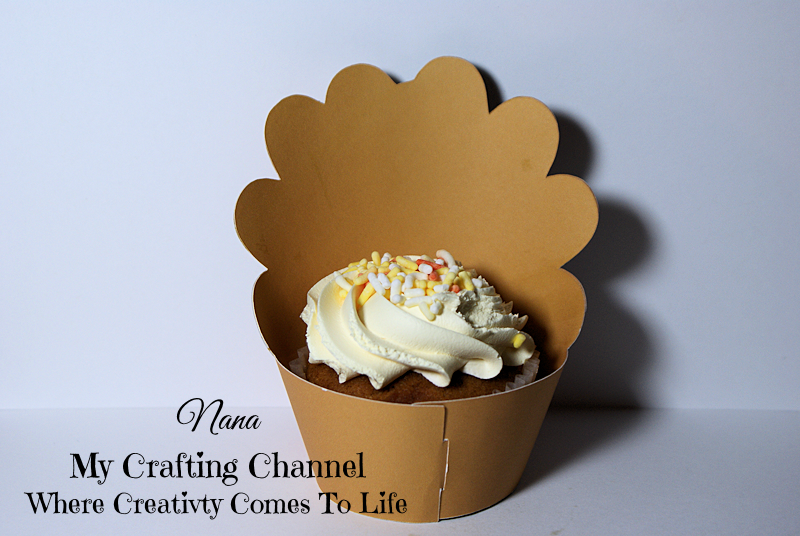 Adorable cupcake holder Nana! Have a great day! Oh my gosh....sooooo darn cute!!! What an adorable cupcake holder you created! Your turkey is so super cute, I love the shading and that sweet face! I love your cupcake holder Nana, the turkey is fun but the filling looks yummy! !